We had our Valentine’s Day dinner at home as planned and it was wonderful. We teamed up to make dinner, with Kim making Ina Garten’s Herb-Marinated Pork Tenderloin and Tony making Roasted Brussels Sprouts and Mushrooms using a recipe from The New York Times. And of course, we shared the “task” of drinking the bottle of 2012 Albert Boxler Riesling we were opening for this special occasion. Tony and Kim describe how they each made their dish as well as their overall impressions of the dinner. Kim: I had made this pork tenderloin before, but if I recall correctly it was a weeknight and I think I only let the pork marinate for 30 minutes, not the suggested three hours, so I was really excited to try it again. Our dear friends Tom and Sharon had also made it recently and raved about it so I knew I was off to a good start. Three pork tenderloins is a lot, so we cut the recipe by two-thirds and purchased one pork tenderloin that was just over three-quarters of a pound. To make the marinade, I started by zesting not quite all of a lemon and squeezing the juice from two lemons. I then minced two cloves of garlic and added that to the lemon juice/lemon zest mixture that I put into a zip top bag. I added rosemary and thyme (we really love these herbs so I probably added closer to the full amount in the recipe, which is enough for three pork tenderloins) and the Dijon mustard (a little less than one teaspoon). I was then ready to add a little salt and the pork. I made sure the marinade coated the pork and then put it into the fridge for three hours. When it was time to cook, I debated on whether to sear the pork and then put it in the oven as the recipe suggested or simply put it under the broiler for 10 minutes (turning once mid-way through) as I’ve done with previous pork tenderloin recipes such as Chili-Glazed Pork Tenderloin. I opted to go ahead and sear the pork on all sides in a pan, which gave it a nice golden-brown color, and put it into a 400 degree oven for 10 minutes. I let it rest for 10 minutes while Tony finished the veggies and was very pleased with how it turned out when I cut into it, despite the very messy pan from the searing. Next time around, I might cook it for a minute or two less just to see if I could have made it even juicier. Tony: The Brussels sprouts and mushrooms were an amazing side and couldn’t have been easier to make. After lining two sheet pans with foil and brushing the foil with olive oil, I cut the stems off the Brussels sprouts, sliced them in half, and put them on one of the pans. I next turned to the oyster mushrooms. The recipe said to cut them into quarters, but they were quite large so I cut them into eighths and put them onto the other sheet pan. Since it was still several hours until dinner, I put the two pans into the fridge. When it was time to cook the sprouts and mushrooms, I drizzled about one and a half tablespoons of olive oil over each pan, sprinkled both pans liberally with salt and pepper, and put them into a 425 degree over. After 10 minutes, I stirred the contents of both pans and put them back into the oven for 10 minutes more. While the sprouts and mushrooms were cooking, I made the gremolata, which is a mixture of garlic, parsley and lemon juice. I wasn’t sure I wanted to make it, but when I looked at the overlap of the ingredients in the pork marinade and the gremolata, I knew they would go together beautifully. As a final step, I put the mushrooms into a large bowl, added the Brussels sprouts, and then added the gremolata. I mixed everything together until it was well combined. Kim and I then plated dinner: a few slices of pork tenderloin with a few scoops of mushrooms and Brussels sprouts with some goat cheese sprinkled on top. 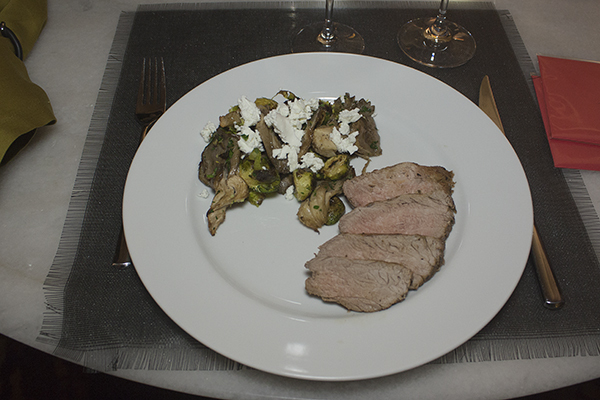 Kim: The combination of the herb marinated pork tenderloin with the roasted Brussels sprouts and mushrooms was terrific, especially with the lovely touches the goat cheese and gremolata added. All these flavors were enhanced with the 2012 Albert Boxler Riesling. Everything complimented each other in a fantastic way–the wine made the flavors in the food come out without sacrificing any of the flavor of the wine. Every bite and sip was a terrific experience and I was sorry to have it end! Tony: This would have been a wonderful dinner no matter what we drank with it but the wine pairing made it spectacular. As Kim noted above, the wine made the food better and the food made the wine better – you can’t ask for much more than that. I think what stood out for me the most was how the wine really made the flavors of the gremolata stand out; I savored every bite and was just as sorry as Kim when dinner was over.